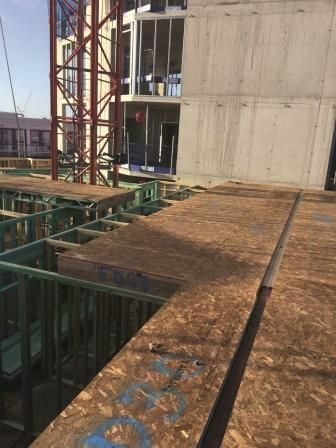 SMARTPLY Flame Retardant OSB3 panels were first developed in response to the STA’s (Structural Timber Association) “Design guide to separating distances during construction” for timber frame buildings above 600 m² total floor area. SMARTPLY FR OSB3 panels also tested to the European fire standards resulting in Euroclass C and B* (flooring applications) performances. A water based, eco-friendly fire retardant is added during panel processing ensuring fire performance whilst maintaining structural integrity and full CE compliance. Manufactured in accordance to BS EN 300, it is the perfect choice for roofing, flooring and wall sheathing where strength, moisture resistance and flame retardance are paramount. Note: Euroclass BFL-S1 suitable for structural flooring. Flame retardant added within the panel. No structural degradation in panel. More lightweight than mineral based alternatives. Made from FSC® timber from our own forests. Zero Ignition® water based fire retardant.